There is no collusion with Russia. There never was any collusion with Russia by the Trump campaign. The only collusion with Russia was the the Clinton campaign, Fusion GPS, and Russian operatives. And yet the Democrats and their media have made the country suffer through their mental breakdown for a year-and-a-half now since Hillary got shellacked in the election. 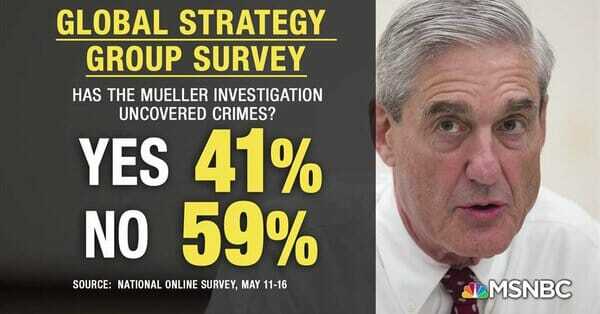 A new poll finds 59% of Americans understand the crimes uncovered by Mueller are political hit jobs and meaningless indictments. Mueller even indicted a company that didn’t even exist at time of the alleged crimes. This disappoints the liberal conspiracy media. Attorney Robert Barnes added: Media annoyed that #Mueller unrelated indictments didn’t work to sell public on bogus Russia collusion delusion narrative. Imagine what happens when #Mueller gets one dismissed or jury acquits?